Stitches: ch, dc, esc, sc, sl st.
R3: Ch3, do not turn (counts as 1dc). 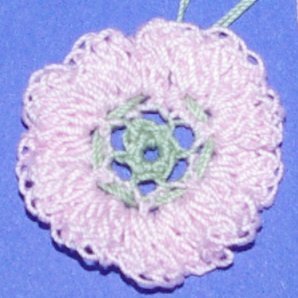 Weave a length of green thread through the openings in R2 (1st pink round) leaving the thread tails on the wrong side. Draw it closed and tie off. This forms the raised center in the ring. 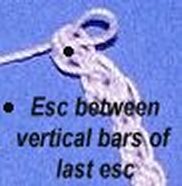 Ch2, esc in 2nd ch from hook. Do not turn. Esc between vertical bars on last esc until ring fits intended finger. Join with al st in 1st ch leaving a yarn tail. 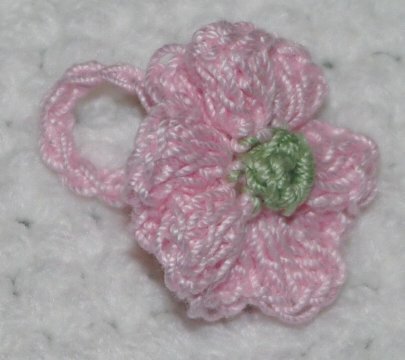 Use yarn tail to sew ring to back side of flower.